Wisconsin Lakes is proud to announce that Lakekit.net, a network of websites of Wisconsin lake organizations, is now a program of Wisconsin Lakes! Lakekit.net was created several years ago by Larry Bresina, a dedicated lake citizen and a graduate of the Wisconsin Lake Leaders Institute. Larry created simple templates using the WordPress web publishing platform and helped interested lake organizations create their own website. Cleverly, those sites were all linked through a networking feature of WordPress that allows many of the background functions of website management to be handled by a single administrator of all of the sites, keeping hosting costs low. With the goal of taking Lakekit.net into the next level of development, Larry brought the program to Wisconsin Lakes, along with new technical service provider Northern Graphics Operations of Minneapolis/Saint Paul, MN. For a limited-time low annual membership cost of $50, lake organizations will be provided training in creating their website (rates will go up in 2019, with a discount offered to Wisconsin Lakes member lake organizations, but the pricing is still to be determined). Hosting for the year is included, though domain registration costs are separate. Your organization’s new site, while appearing to the public as a free-standing site, is actually part of a network of sites which allows administration and feature development to be handled by Wisconsin Lakes and Northern Graphics, keeping hosting costs as low as possible. In addition, network members can access peer-based support from fellow members, and limited technical support from Northern Graphics for no additional cost. With new websites costing in the thousands of dollars, this is a very cost-effective way to get a modern, smart-looking website for a reasonable price while also becoming part of a community of lake organization website owners. By far the best way to become a Lakekit.net member in 2018 is through a workshop being offered at the 2018 Wisconsin Lakes Partnership Convention (Wed, April 18, 9-12am in Stevens Point). Taught by representatives from Northern Graphics Operations, participants will work to adapt a site template to their lake organization. Participants will need to bring their own laptop, as they will create and edit webpages using WiFi during this hands-on workshop. More information on the workshop and the WI Lakes Partnership Convention can be found on the homepage of the Convention. The cost of the workshop is $75 until the early bird registration deadline of March 21 and includes the $50 lakekit member dues for 2018. Earlybird registration After March 21, the price goes up $5. 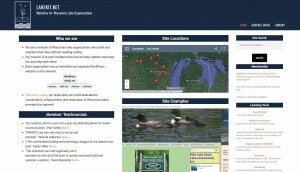 Visit the program homepage at lakekit.net, where you’ll find information about the network and membership, the design templates offered and links to member sites to see what you can do for your lake with this powerful tool.